A new season means a new wardrobe. It is the only reason we’re okay with summer ending. There is nothing like shopping for a new pair of suede boots and a cozy faux-fur vest. Topshop at Hudson’s Bay is a one-stop shop for any look, from office chic to date-night outfits. To help you plan your autumn look, here are 10 Topshop-approved rules on how to adopt this fall’s top trends. Keep reading for 10 tips to transform your look this season. Shop all these trends at Topshop at Hudson’s Bay and TheBay.com. Denim is a trend that refuses to go away. 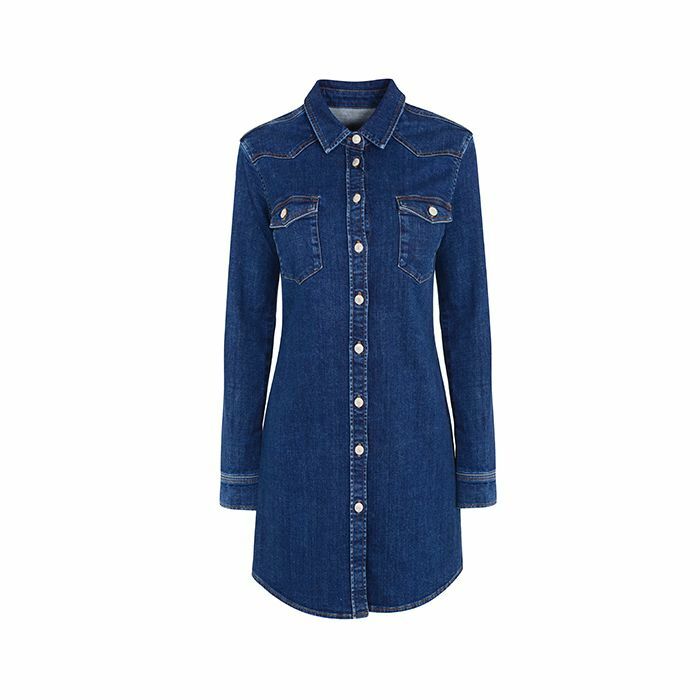 This season we’re channeling the denim looks of the ‘70s. Say goodbye to your skinny jeans, because this fall is all about the flare. Fringe is 2015’s must-have trend, and it is taking on a new form this fall in oversize outerwear, from ponchos to scarves. Pair them with fringed suede booties or a clutch for the perfect boho look. Navy is the new black. Wear your tailored navy blazer or trousers to the office for a sophisticated and pulled-together look. Print is taking a backseat to solids this season, but animal print is the exception. Add an animal print in a statement piece like a faux-fur coat or handbag to punch up your outfit. Knit sets make dressing in the morning effortless. Cozy and fashionable, they are a win-win! Opt for grays and neutrals for a modern monochromatic look. A classic for fall, plaid and checks are back this season in flannel tops, blanket scarves, and skirts. They are also the perfect print for layering. Style your plaid flannel shirt by tying it around your waist or pairing it over a turtleneck. Speaking of layering, this season sleeveless jackets are the perfect outfit topper. Tailored or loose-fitting, toss them over your LBD or jeans and T-shirt for an instant upgrade. Hopefully we won’t need to pull out our parkas too soon, but it is good to be prepared. This fall add some glam to your parka with a little faux fur. Over-the-knee boots go with everything, from your boho dress to your dark denim. If you are going to invest in any item for your fall wardrobe, make it a pair of vintage-style suede boots. Fall nights are cool, and sometimes we don’t want to throw on a mini and freeze. A chic suit is the perfect solution to dressing for those chillier nights out on the town. Try a pop of colour or go sans top under your blazer for a sexier date-night look. What rule will you live by this fall? Share in the comments below!